Defra Minister Lord de Mauley has confirmed to Animal Defenders International (ADI) that the Government will press ahead with legislation to ban the use of wild animals in travelling circuses but a loophole will allow circuses to continue to tour with these animals provided they are not displayed. ADI and MPs say this will make a mockery of the draft legislation which has widespread public and political support and are calling for the law to be strengthened. 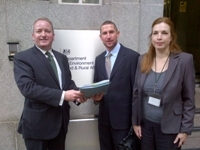 Lord de Mauley made the statement during a meeting, held on 21 October with ADI and Mark Pritchard MP (pictured), whose backbench debate led to the unanimous vote for a ban on wild animals in circuses in June 2011. It comes ahead of the publication of Defra’s response to the report by the Environment, Food and Rural Affairs Committee (EFRA) on the draft Wild Animals in Circuses Bill, which will be published on 22 October at 11am. 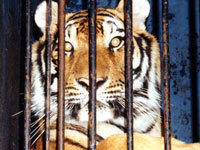 Under the Bill the Government seeks to ban the use of wild animals in circuses by December 2015. However only the “use” of animals – namely the performance and the display – will be prohibited, meaning that wild animals in circuses will continue to be subjected to the same inherent welfare problems associated with the travelling circus that they currently endure. ADI was pleased to hear Lord de Mauley state that Defra did not agree that the ban should apply solely to elephants and big cats. ADI had previously expressed its profound disappointment at this ill-informed suggestion by EFRA, which flies in the face of overwhelming public opposition to the use of ALL wild animals in circuses, which has remained consistently high for over 15 years. Time however is running out for the legislation to be introduced ahead of the proposed implementation date of December 2015. As had been feared, by delaying action on the circus ban the government has opened the door to new wild animal acts and further animal suffering. A new lion and tiger act presented by Thomas Chipperfield – a relative of the notorious Mary Chipperfield, who was prosecuted for animal cruelty following an ADI expose in the late 1990s – is now performing with Jolly’s Circus, one of two remaining English circuses to perform with wild animals, and the only act of its kind in the country.